The La Veta Beautification Committee completed its planned projects this weekend by finishing the street plantings, the hanging lights and holding the 1st Annual Main Street Beautification Benefit Golf Tournament hosted by Grandote Peaks. The Tournament was sold out, raising over $5,000 for the beautification projects. Our special thanks to Dave, Kelly and Randy Briggs. 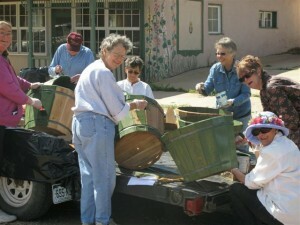 This added to the other generous contributions individually ranging from $15 to $3,000 insures ongoing projects and grants from this year’s maiden groundwork to beautify La Veta’s Main Street area. Liz, Mitzi, Marta and Sandra thank all their supporters, volunteers and donors , as we likewise thank them for all of their contributions. A big weekend planned for Art Galleries in La Veta. Come to the multi-gallery tours on Saturday 5 to 7 pm at SPACe Gallery, Pinon Hill Pottery, The Bakery and La Veta Fine Art Gallery. Free and Refreshments. Most of us located in the County have been handicapped by slow dial-up internet service. Technology does give options for satelite or cell-phone internet but not for a broad-band, high-speed service via our land-line phone carrier service, unless you live right in La Veta or Cuchara proper. And many areas have limited cell-phone coverage still. Kent Mace with DD Wireless proposes to provide another alternative. A small direct (line of site) tower to provide high speed service with open bandwidth of 10 MB for about $50 per month. We look forward to any improved coverage options here in the valley. A beautiful morning today. And a big day ahead for us. 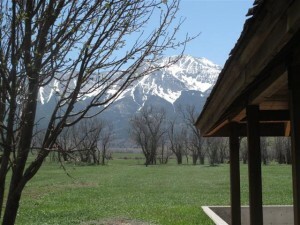 At 11:00 this morning, we will close on the Sale of another wonderful ranch here in the valley. With their permission, I will try to post more ranch photos and details later. Recent winds have caused several electrical outages from arc of power lines. Today’s resulted in a small brushfire right up our valley, near the Little Kansas development area. As of this time, no news on damages but we understand that the blaze was quickly contained and put out. Winds, lightning and even control burns are just a few of our fire threats this time of the year. A small control burn just over the state line into New Mexico has caused another wildfire in the Vermejo Park area just south of us. No fire restrictions yet, but we hope all campers use extreme care in their campfire activities this Memorial Day Weekend. Late Spring storms are keeping our weather very unsettled so far. Saturday winds were uncomfortable but Sunday was very nice around here. But not so out on the eastern plains. Our friends around Lamar got more rain and hail again. Front range is windy, western slope has a wildfire alert and San Luis Valley forecasts a hard freeze tonight. Just to let you all know, Kelly Popejoy from Grandote Peaks Golf will be the call in guest on the Tee to Green Radio Show broadcast in 170 countries, on Armed Forces Radio, and on Sirius Chanell 122 and XM chanel 143 on this Sunday May 23rd, at 8:30 am. They are giving an 8 minute spot to plug the course, and our area. I hope you all tune in to hear the show! Beautification project got underway with prep. and painting of planters. Weather was great and participation was wonderful. Beautification Day gets under way this morning. Liz and Marta have their volunteer baskets of paint, brushes, stencils and soil/peatmoss all ready to go. This gets all the planters ready for next Thursday (5/27) when volunteers will again show up to plant and sweep sidewalks and gutters. Volunteers have been coordinated by Sandra Eddy. Marta will show up with goodies from The Ryus Bakery and John at Two Peak Coffee Shop will have hot coffee to reinforce the volunteer troops. Truly a community effort!